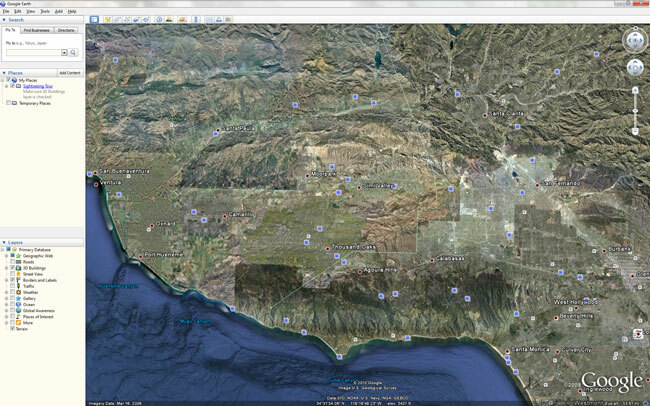 I finally made time to install Google Earth on my "new" laptop, and was reminded once again how absolutely cool it is. That this capability exists is amazing enough, but that it is completely free - even free from advertising - is astonishing. Google might come under fire for some of their practices and policies, but they are still quite a phenomenon. I especially like using Google Earth in conjunction with my spiffy 3DConnexion Navigator, a little hockey-puck shaped navigation device which comes with an interface to Google Earth. It makes zooming around really easy, rotating, tilting, etc. Quite remarkable.